Braving the elements to legalize marijuana in Washington state. Christine Clark stood for two hours in the freezing air outside of River Park Square last Friday as the sun went down. Cold-looking people hurried in and out of the mall, passing by the 70-year-old woman in a white stocking cap and a sandwich board, as light snow joined the perpetual loop of holiday music in the air. 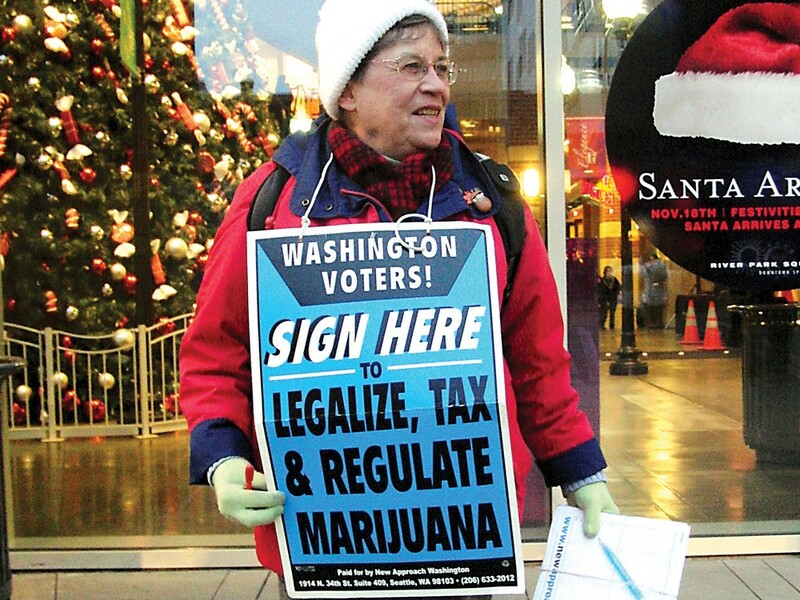 She stayed in the elements, bundled up, busily collecting signatures to legalize marijuana. All she needs is 241,153 signatures. So far, she’s gathered about 50. Thankfully for her, she isn’t alone. New Approach Washington has cobbled together an impressive group of health care and law enforcement professionals to convince voters in the state that marijuana isn’t the devil weed after all. Recent endorsers include former U.S. attorneys John McKay and Kate Pflaumer; and former Seattle FBI boss Charles Mandigo. Also on-board are Pete Holmes, Seattle’s elected city attorney; and Dr. Kim Thorburn, the former top public health official for Spokane. The group has raised more than $1 million and has expressed confidence that they will gather more than enough signatures to succeed. They could do worse than to have Clark as their face in Spokane. Short and smiley, Clark is a retired lab technician. Most recently, she worked as a medical technologist doing emergency-room drug screenings. She’s a grandmother. And she’s bright, citing statistics as if they’re her kids’ birthdays. Her straightforward manner doesn’t hurt much, either. She trots up to anyone she’s pegged as friendly to the cause or amenable to signing petitions. Or, really, anyone nearby. I-502, as it’s called, would legalize the possession of up to an ounce of marijuana while putting a hefty tax on a state-licensed production-and-distribution chain, generating an estimated $215 million in revenue for the state every year. Half of that would go straight to law enforcement and treatment programs. The initiative would ban possession for anyone under legal drinking age and set a standard for driving while high, relying on a test that can detect recently consumed THC, the active ingredient in marijuana. In her experience, Clark says, young people and those older than 60 are more apt to sign. She gets Rick Kimball to stop. Of course, the effort to fully legalize pot hasn’t come without its critics. Oddly, some of the loudest so far have been other marijuana advocates. Vivian McPeak, who helped found Hempfest, says he doesn’t support the effort, as have a number of activists. And, as critics have pointed out, the federal government would surely challenge the initiative if it becomes state law. With the backing of the Controlled Substances Act, federal agents could raid and shut down the state-run stores, and a judge could scrap the entire system with the swipe of a pen. The millions of dollars made on marijuana sales could go straight to the federal government, as the sale would simply be deemed another illegal drug deal. Earlier this year, U.S. attorneys ordered the raids of dozens of medical marijuana dispensaries in Eastern Washington. But Clark is putting her all into the effort, which mirrors a similar measure in Colorado. Once enough signatures are collected, it will head to the state Legislature, which could adopt the measure and put it into law or, more likely, send it to voters in November. “What I’m doing is planting a seed,” Clark says. Many people are afraid to put their name on an initiative, she says, because it can be made public. A ballot, on the other hand, is confidential. “If it comes to the ballot, they’ll vote for it,” she says confidently, eyeing the passersby.